While the use a Montessori approach cannot cure Alzheimer’s and other forms of dementia, it can help address symptoms, delaying its progression. More importantly, the creation of a healthy environment, tailored towards the needs of individuals with dementia can help to not only alleviate the negative behavioural symptoms that accompany the disease, but contribute to a better quality of life. Using a Montessori approach has proven to have a positive effect on engagement, behaviour and mood. At Dementia Support we are committed to teaching anyone who comes into contact with people that have dementia on how to create this healthy environment tailored to each individual’s needs. 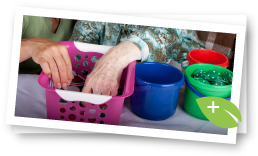 Dementia Support focuses on practical tools that anyone can easily implement in any environment, be it a nursing home, retirement home, private home care and hospital settings. We won’t leave you hanging with our simple implementation training but provide you with actual Montessori Tools, Montessori Activities and simple instructions that anyone can follow. All this delivered right to your door! People with dementia can do so much more that what most caregivers think. Environments just need to be presented in a specific way to allow the person with dementia the feeling of independence and success in accomplishment. Let Dementia Support help you bring a healthier and more successful way of caring for those that have Alzheimer’s and other forms of dementia.